Fast and really crisp printouts are what the HP CM6040f specialises in. At some time your HP CM6040f will gobble up all of your printer toner, and when it finally does happen you'll quickly note that replacing HP CM6040f toner tends to be really pricey. But you do not need to bother about coughing up the steep prices you'll see on the main street because now at Cartridge Save you can pick up all the HP CM 6040f cartridges you will need at very small prices. Start saving money by ordering online at Cartridge Save! There's no sense at all in spending so much on the CM-6040f original cartridge or CM6040f compatible toner in the main street when it is simple to save a wadge of cash shopping online with Cartridge Save. Have perfect satisfaction when you purchase Colour LaserJet CM6040f toner cartridges from us as everything is guaranteed by a quibble-free money back guarantee. Keep in mind that each and every purchase also has free delivery, most likely arriving at your address on the next working day! The HP Colour LaserJet CM6040f is a multifunction printer capable of multi-tasking. It can print as many as 200,000 pages per month and it has a maximum print resolution of 1200 x 600 dpi. Print seeds are an impressive 40 ppm. The HP Colour LaserJet CM6040f also has the convenience of digital sending. This multifunction printer delivers excellent output for fax, scans, copies, and prints. It could have been better if it had built-in Wi-Fi. Weighing 319.5 lbs and with dimensions of 27.7 x 26.5 x 47.9 inches, the HP Colour LaserJet CM6040f definitely needs a large space in the office. The whole unit has wheels at the bottom. It has plenty of space for paper cassettes, too. The HP Colour LaserJet CM6040f can handle as much as 2100 pages at a time. The control panel is easy-to-use as it has a touch LCD screen. For the convenience of users, the HP Colour LaserJet CM-6040f printer has digital sending features plus it has security features too to prevent unauthorized usage of the machine. Users can expect high-quality output from this reliable workhorse. Networking is easy as the HP CM6040f colour laser printer has built-in Ethernet and it is compatible with both Macintosh and Windows computers. To save resources, the Colour LaserJet CM6040f has a duplexer and ADF. This HP CM6040f multifunction printer could have been better if it had Wi-Fi. 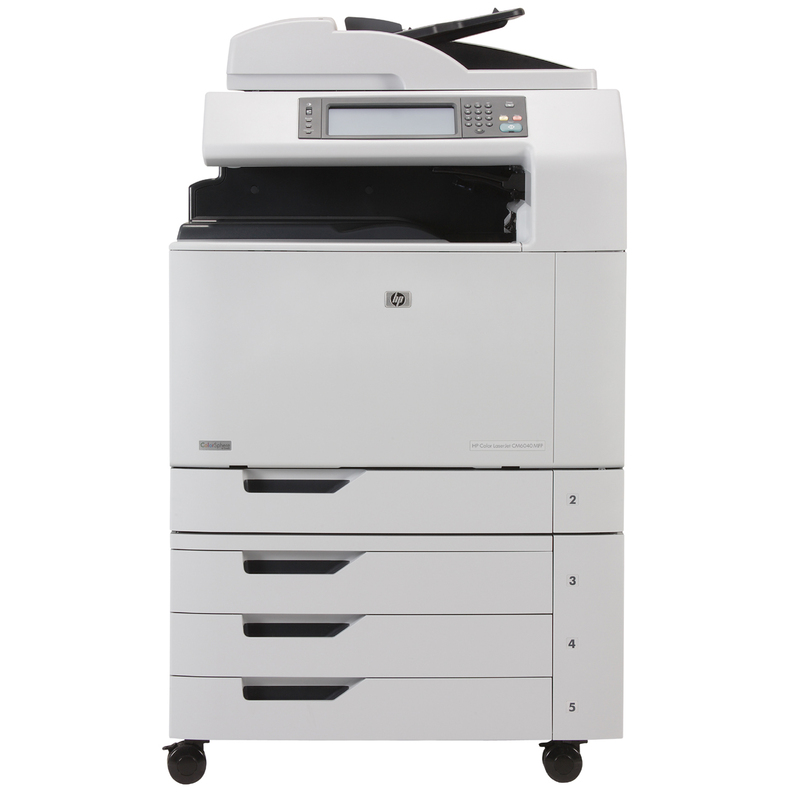 The HP CM6040f MFP can also do with the addition of features such as memory card readers or extra USB ports.